Jared Kushner, Ivanka Trump, and Donald Trump making America great again. The New York Observer has endorsed Donald Trump for president, making it the only newspaper other than the National Enquirer to do so. 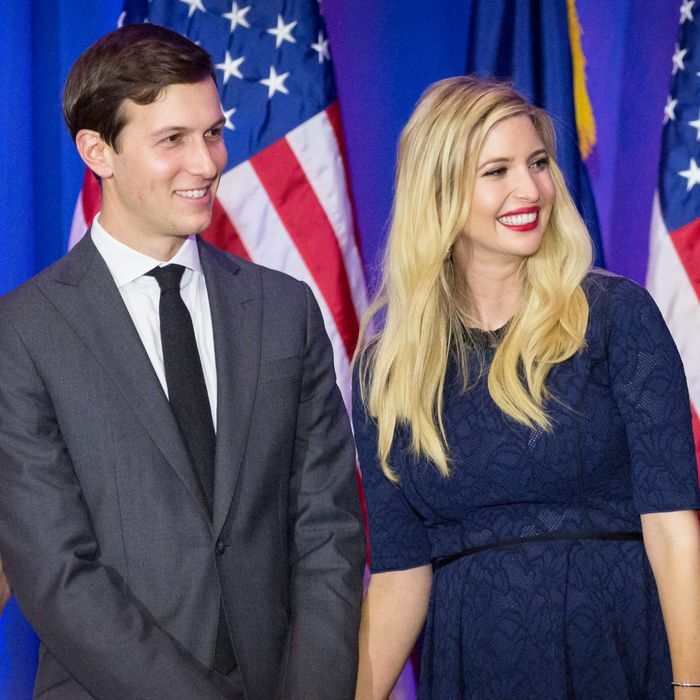 The Observer is published by Jared Kushner, Trump’s son-in-law, but it would be unfair to dismiss the editorial’s merits merely on account of the familial connection. It is actually its merits that make the endorsement so noteworthy. The editorial not only throws itself behind Trump the man, but, in a kind of tribute to its subject, also apes his method of reasoning, or lack thereof. In some ways it resembles a Trump speech — slogans, boasting, vacuous repetition — but without the periodic interruptions to threaten protesters with beatings. What’s missing from the editorial is a cogent rationale for a Trump presidency, despite its length — almost 1,400 words, nearly twice as long as a New York Times column. Let us consider all of them in their vapid beauty. Donald Trump is the father-in-law of the Observer’s publisher. That is not a reason to endorse him. Giving millions of disillusioned Americans a renewed sense of purpose and opportunity is. Explaining the phenomenon that is propelling the Trump candidacy is easy, despite the nattering of the cognoscenti—the media elite, the professional political class and the people largely insulated or directly benefitting from the failures of the last seven years. Their opinions have become increasingly irrelevant. For in the 10 months since Mr. Trump’s campaign announcement, their “insights” have been uniformly wrong and their influence has dwindled. To summarize the point of this paragraph: The critics are wrong because Trump is winning. Since the editorial will reiterate this theme many times, it’s worth noting that it simply assumes away the possibility that people might embrace a candidate who has bad ideas. It likewise treats the people who support Trump as representative of the public as a whole, ignoring the far larger group of people who dislike him. The media and cultural elite’s inability to grasp the profound alienation, anger and disillusionment of millions of Americans has fueled Mr. Trump’s popularity. The media’s enthusiastic embrace of the Obama narrative—that America should be willing to accept a dimmer future—has blinded it to the appeal of the Trump candidacy, and of an alternative, more compelling narrative. People like Trump, ergo, Trump is right. This year, more people have turned out to vote in Republican primaries than ever before in our history. They have done so for a simple reason: they too believe that America can be great again. They have responded to Donald Trump’s singular message. When Mr. Trump celebrated his victory in the Nevada primary, he included a line the elites found irresistible: “I love the poorly educated.” They tittered and Twittered with glee over what a buffoon these unwashed mongrels are supporting, somehow neglecting to notice that Mr. Trump won among—and thanked—just about every demographic in that caucus and in a couple dozen others as he’s clawed his way to a substantial delegate lead. It turns out that the “poorly educated” are just one group of decent, engaged American citizens who have felt overlooked by the kingmakers and storytellers. Mr. Trump announced his candidacy on June 16, 2015, never before having run for any political office. Three weeks later, the Economist/YouGov poll found him to be the front-runner. In the 10 months since, and despite near-universal media-bashing tinged with sarcasm and disbelief—not to mention the efforts of 16 declared Republican alternatives including eight governors and five senators—Mr. Trump has never relinquished that position. The media tried very hard to construct excuses and rationales for his success. 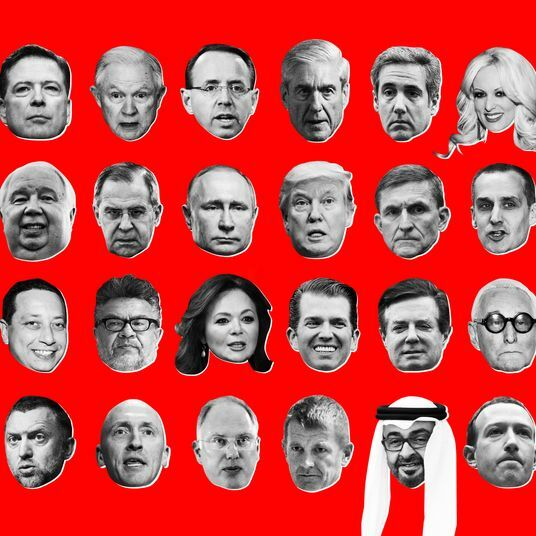 Mr. Trump was a celebrity, an entertainer; he knew how to play the media and gain its attention; his policies grabbed headlines but lacked the specificity of his rivals—which gave him an unfair advantage. But what every pundit’s platitudes missed was simple: they failed to recognize that Mr. Trump’s success is the result of one thing—optimism. Mr. Trump was tapping into the pent-up desire of millions of voters to make America great again. It is not merely a political slogan; it is a vision and an attitude. It depends not on 14-point proposals or an SAT-like cramming of policy details. It depends on faith and leadership. Faith that Americans have the will to craft a brighter future, and the leadership to make it happen. This is a very positive way of describing Trump’s ignorance about public policy. Throughout his career, Donald Trump has demonstrated real leadership. And he has done so in the private sector where people’s livelihoods depended on his vision, his decisions and his ability to get others to embrace that vision and act in concert. The legacy of those 30 years of leadership is everywhere to be seen. Not only in the tall buildings that bear his name, but in the kitchens of the thousands of families supported by the jobs he created though these projects. We were reminded recently of how Mr. Trump first came on the public scene. It was 1986 and Wollman Rink, Central Park’s ice-skating facility was out of commission. A renovation that was supposed to have taken two years and cost $9 million had already consumed six years and more than $13 million—and there was still no completion in sight. Mr. Trump convinced Mayor Ed Koch—over a great deal of opposition—to allow him to take on the project. Mr. Trump offered to risk his own money, and only recoup the investment through more efficient operation of the facility and an adjacent restaurant. Mr. Trump completed the work in four months and under budget. Thirty years later, it is still cited as a far-too-rare example of leadership in action, of a can-do spirit. Today, Mr. Trump’s iconic buildings, hotels and golf courses dot the landscape of not only New York, but of America and the world—testament to his ability, still, to get things done. Point taken: Trump did a good job with that ice-skating rink. As a presidential qualification, this does not exactly compare with, say, Eisenhower’s job defeating Nazi Germany, but it was very nice for the skaters. This paragraph argues that, while Trump’s business successes are evidence for his qualifications, his business failures are not evidence against them. Before any endorsement is made, a full and fair assessment of the other candidates is essential. On the Republican side, that proved problematic, since it is hard to take either Ted Cruz or John Kasich seriously as prospective GOP standard bearers. Ted Cruz may be the most disliked person ever to sit in the United States Senate. And we are still wondering if his “New York values” comment was a veiled embrace of anti-Semitism. It is interesting that the case for Trump over Cruz rests on disqualifying an opponent because of a comment that may have bigoted undertones. Say, has Trump ever said anything that might cater to racist stereotypes? Never mind, let’s move on. John Kasich presents a more elusive challenge. He seems like a decent enough fellow with a record of conservative political achievements. But he’s been finishing fourth out of three candidates and his inability to gain traction with voters suggests that his candidacy is little more than a place-holder for someone the media hopes to anoint—other than Mr. Trump. This paragraph dismissing Kasich actually contains a stronger rationale for his candidacy — “a decent enough fellow with a record of conservative political achievements” — than the entire rest of the endorsement does for Trump, who is neither a decent-enough fellow nor possessed of a record of political achievements. Which brings us back to Mr. Trump, not by default but by choice. We are reminded of another presidential candidate who was derided for being “just an actor” and for proposing a vision for a stronger America. Today, many people forget what propelled Ronald Reagan into the White House in 1980. There were a small number of simple messages that resonated with voters that year, and they were universally disparaged by the media as being shallow. The first was that as governor of California, Mr. Reagan had turned a state budget deficit into a surplus. Mr. Reagan would tell voters that he was willing to sit down with both union leadership and state management and get them to talk to each other, and to find common ground in the public interest. He reminded voters that he had honed his skills as president of the Screen Actors Guild, and later negotiated better, smarter deals for the common good of the people of California. Ronald Reagan’s second message in 1980 was even simpler. During his only debate with President Carter—yes, there was just a single debate—Reagan asked Americans: Are you better off than you were four years ago? Some of the lines Trump uses sound kind of like some of the lines Ronald Reagan used. To be fair to the Observer, this is a standard trope for any Republican endorsement. Today, Donald Trump is asking a similar question: Do Americans want to continue on the path of the last seven years or forge a new direction? Do we want to continue policies that erode America’s influence and safety in the world? Do we want to continue the politics of gridlock? Do we want to continue to undercut our prosperity and limit individual opportunity? Or do we want to move in a different, more promising direction? Trump, like all of the Republicans, is promising to be different from President Obama. This is not a reason to support Trump over other Republicans. The latter choice, the right choice, will only be accomplished by someone who has constructed great skyscrapers and gem-like skating rinks; started businesses, written best sellers and built brands. Tried and succeeded and sometimes failed. But who has gotten up and tried again. Here we have an assertion that constructive change “will only be accomplished by someone who has constructed great skyscrapers and gem-like skating rinks,” even though 0 percent of the previous 44 presidents have experience in skating-rink construction. We have a suggestion for a Republican establishment dismayed by this unlikely candidate’s unlikely success: instead of monomaniacally focusing on tearing him down, those who care about the future of the party should reach out to Mr. Trump and help him grow as a candidate and a leader. He has demonstrated that he alone among the Republican field can attract new voters to the tent and shine fresh perspective on issues that badly need attention, such as America’s commitment to NATO and trade deals that have sailed through Congress without much debate about their effects on American workers. The last sentence gets around to mentioning NATO and trade deals, which is notable because this half-sentence is the only part of the editorial that mentions any policy issue. It does not make a case for Trump’s positions on these issues, though. It merely asserts he has used them to attract supporters, thus circling back to its central theme that the existence of Trump voters proves Trump is right. In 1980 Ronald Reagan said, “The time is now for strong leadership,” and by 1984 was able to declare, “It is morning again in America.” Today, Donald Trump says it is time to make America great again. We agree. The conclusion is already repeating the Reagan comparison for the second time and the “make America great again” slogan for the third time. This double-length editorial contains the analytic power of a message that can literally fit on a baseball hat.